There’s a luscious creaminess that only fresh ricotta cheese can provide. 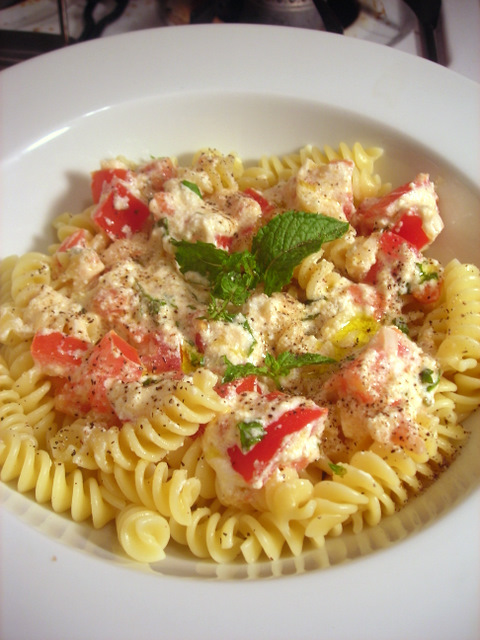 Sweet, ripe tomato, chopped mint and cracked black pepper contribute piquant bursts of flavor. You really don’t need much else. 11 Aug	This entry was published on August 11, 2011 at 12:55 am. It’s filed under food, food photography, general, Italian food, summer, vegetarian and tagged dinner, pasta, tomato, vegetarian. Bookmark the permalink. Follow any comments here with the RSS feed for this post. I like the addition of the mint!